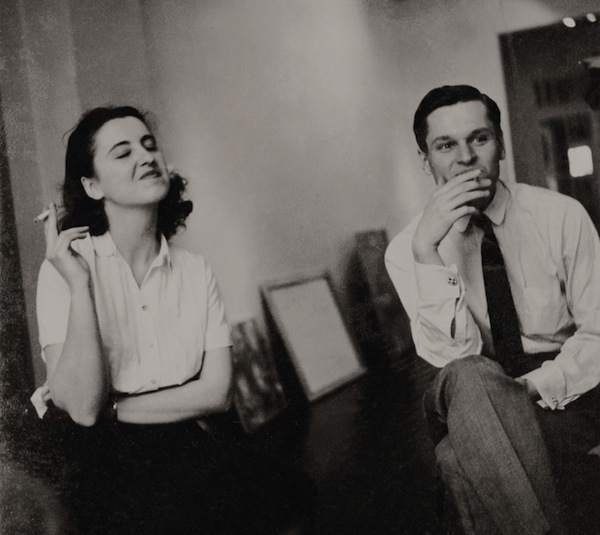 Jane Freilicher and John Ashbery at Tibor de Nagy Gallery, 1952. Photo: Walter Silver. I’M WRITING THIS in a room that contains a number of pictures, mostly by women, as it happens. One is by Jane Freilicher, a still life in pastel that brings together a half-dozen miscellaneous objects, including a few roses that are having the floral equivalent of a bad hair day, a reddish-brown pamphlet that was probably an address book sent to customers by the phone company (remember those?) and a copy of Art News, flopping over the edge of the table, confronting the viewer, in the time-honored tradition of trompe-l'oeil perspective, but also subtly spoofing it. Jane gave the pastel to me once, perhaps to commemorate my becoming an editor at Art News in 1965 and moving back to New York after ten years in France. Jane was in fact the first person I met in New York. When I arrived in June, 1949, fresh out of Harvard, my friend Kenneth Koch had said I could stay at his apartment while he was away; I had only to pick up the keys from Jane, who lived above him in a small walk-up building overlooking the Third Avenue El at Sixteenth street (one of Kenneth's favorite diversions was to don a rubber ape mask and gaze out the window at trains as they passed by). I rang the bell and Jane came down and invited me up to her place for a coffee. I didn't know much about contemporary art at the time, and had never heard of the exciting teacher Hans Hofmann, whom Jane and other painters I would soon meet had studied with. It turned out that Hofmann, an abstract expressionist, didn't try to impose his own ideas about art on his students, but somehow encouraged them to be more like themselves. I did notice a few small paintings of Jane's in her living room. They seem, in retrospect, funny, discreet, comforting—all things I associate with her. On my desk is the announcement of her last show in September, 2014, a color lithograph still life called Roses and Chrysanthemums, 2014. It is more straightforwardly realistic than the Art News pastel, yet there are “mysteries of construction,” in Marianne Moore's phrase. For instance, one rose is so meticulously, magic-realistically rendered that it seems to belong to another picture, indeed to another century. But its “lovely companions,” more summarily sketched in, don't seem to notice or mind particularly. Each has a different agenda. Democracy rules. That's what I love about her work—the democratic vistas. Her pictures seem to have come into being all by themselves—almost. The painter sort of showed them how to do it and then returned to her other work—fixing lunch, maybe, opening the mail, and coming back to check on the picture and make sure it hasn't gone off the rails. The resulting creations look unfinished and incredibly strong. I made this, each of them seems to say. The artist? Yeah, she helped a little, maybe even a lot. Okay, so it was her idea all along. John Ashbery is a poet based in New York. 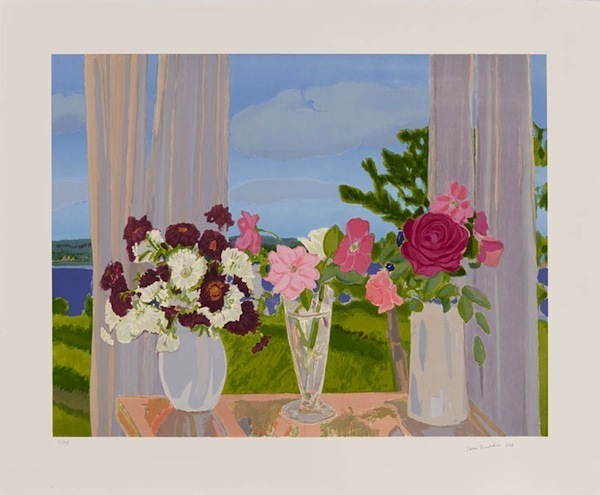 Jane Freilicher, Roses and Chrysanthemums, 2014, color lithograph, 27 x 34”.